The capital of Colombia is a fascinating place brimming with art, history, a mouthwatering gastronomic scene and with new, trendy coffee shops popping up constantly; it is a coffee lovers dream. 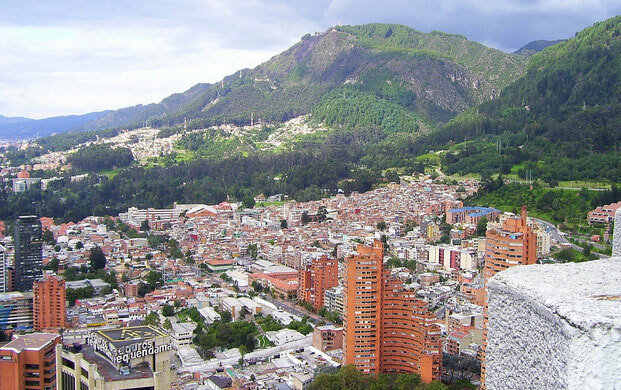 Bogota is a huge city which over 10 million people call home and is made up of different districts and neighbourhoods. Each one offering something different from the last, and it can be difficult to know where the best place to stay is. From the colourful and historic centre, to various other trendy neighbourhoods, the choice is a little overwhelming. We spent 8 days in the city when we originally only planned to spend 4 and it has remained one of our favourite places in all of Colombia. 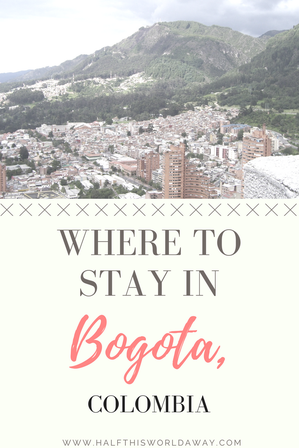 We stayed in different areas throughout the city, got a feel for each one and what they offered and have pulled together this guide on the best places to stay in Bogota. 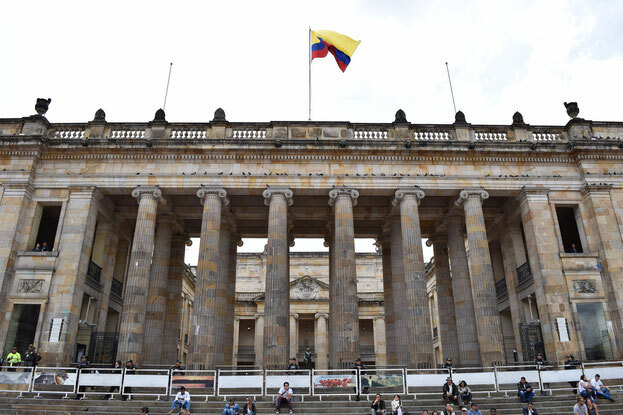 We really could not get enough of this city, despite hearing mixed reports about it from other travellers in terms of safety, we felt comfortable in Bogota and would encourage any visitor in Colombia to pay a visit to this bustling capital. Each area of Bogota varies greatly, so deciding on the best place to stay depends on what you are interested in. 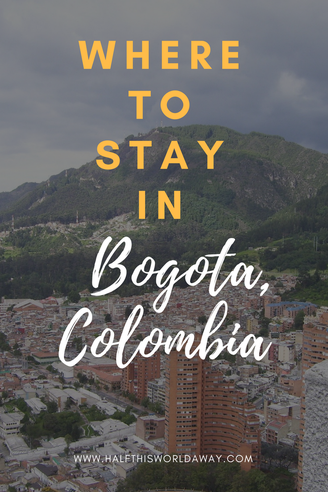 We've outlined our favourite neighbourhoods in Bogota and the best things to do in them, so if you are looking for where to stay in Bogota, we're sure one of them will be right for you! Zona Rosa is the "fancy" area of Bogota filled with the best bars, restaurants, shopping malls and 5 star hotels. It's always busy, day or night and is completely safe to walk around regardless of the time of day. It's a cool area filled with locals and tourists alike, and if you stay here then the best of Bogota will be on your doorstep. If you want to stay in Zona Rosa then we would highly recommend the hotel GHL Hamilton. You can check prices and availability here. Although Zona Rosa is mainly filled with hotels on the pricier end of the scale, there are some budget options available. Top Tours Accommodation has rooms from £29 and gets great reviews. You can check prices and availability here. Chapinero is another cool and trendy area in Bogota, home to a large expat community as well as the chosen student hang out, results in a lively and fun part of town. Our favourite part of Chapinero (and possibly, all of Bogota) is the area of Zona G which is known as being the "gourmet district". Walking round Zona G, you quickly forget you are in Colombia's biggest city and could be forgiven for thinking you were in a little town in the English countryside. With cute little eateries lining the streets, white picket fences and red brick buildings with ivy snaking up their sides. It is a picture perfect little corner of Bogota. Chapinero is also home to our favourite hotel in all of Bogota, Casa Legado. Casa Legado is a luxury hotel which offers a completely unique experience. Whilst this is one of the most expensive hotels in the city, it is not your typical luxury hotel and if you want to splurge a bit during your stay then this would be the ideal place. You can check prices and availability here. Alternatively, there are some budget options here as well. Hotel Colonial Inn is on the cheaper end of the scale yet still offers clean, comfortable rooms. You can check prices and availability here. La Candelaria is a district in downtown Bogota, it is colourful and loud with a bohemian vibe. This district is a reminder of Bogota's colonial past with its narrow, cobbled streets and vibrant buildings with interesting architecture. 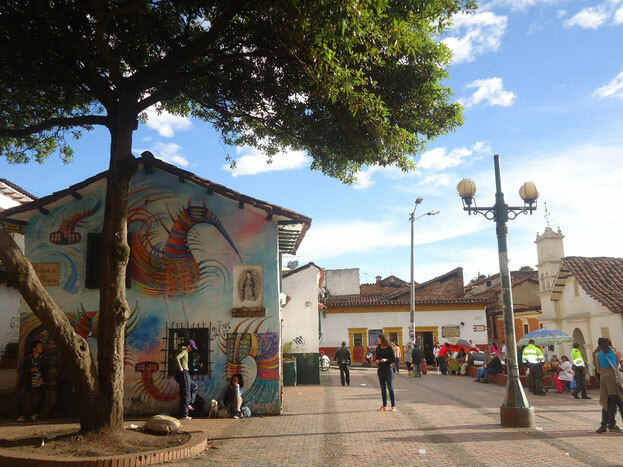 La Candelaria is the centre of the tourist hub and a fascinating place to wander during the day with many of Bogota's walking tours leaving from this area. However, La Candelaria is not the safest part of the city after dark and we would recommend you stay in other districts. However, there are still lots of hotels in the area and it is a popular place for budget backpackers. Zohar Hostel is a great budget option and you can check prices and availability here. However, If your budget stretches further then one of the most beautiful hotels in the area is The Orchids with ornate colonial styled rooms and incredible architecture. You can check prices and availability at The Orchids here. We nearly didn't visit this area of Bogota and what a travesty that would have been as its one of our favourite places in the whole country. Usaquen sits in the north of the city and used to be its own town, however as Bogota grew extensively, Usaquen soon became part of the city and it is now one of the trendiest neighbourhoods around. There are countless bars and restaurants here, as well as some incredible coffee shops. 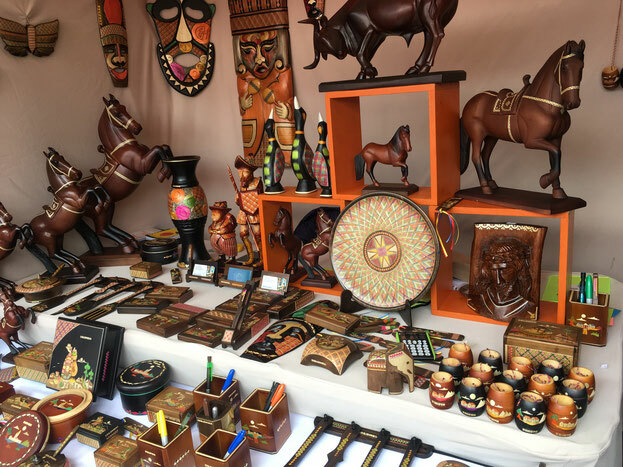 If you can then you should visit on a Sunday when the market is there and you can purchase everything from local street food to beautifully crafted goods. We absolutely loved Usaquen and would highly recommend you spend some time here. Biohotel Organic is a green hotel in Usaquen with a funky, laid back atmosphere. You can check prices and availability here. 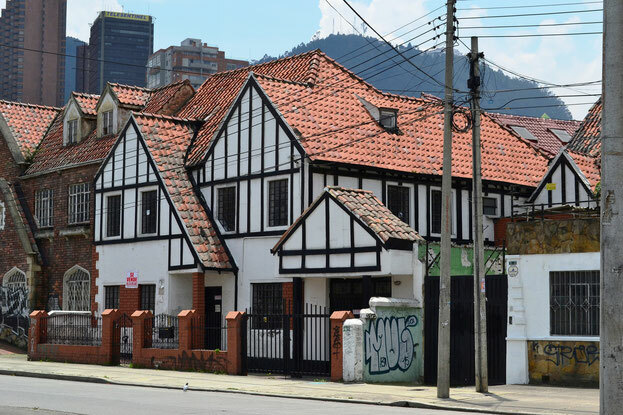 An alternative budget option is Rua Hostels Bogota. You can check prices and availability here. If you are looking for an area of the city which is quiet, a little more green and handier for the airport then Barrios Unidos is the perfect fit. Situated next to the Simon Bolivar Park, this area its more residential and relaxed than the other, busier districts and is perfect if you want to be closer to Bogota's airport. As well as having a huge park on its doorstep, Barrios Unidos is also home to an amusement park and the Metropolis shopping centre. We stayed in the Agora Suites in this area of Bogota which had spacious, modern rooms and really friendly staff. For prices and availability you can check here. Bogota is a huge city with so much to offer every kind of traveler and we loved our time here. 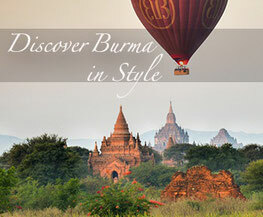 It is one of those cities which is constantly evolving and changing, and one we know we will return to. 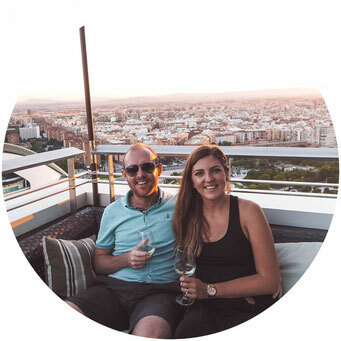 If you have enough time then we would recommend splitting your time in Bogota between a couple of different districts to enable you to get a real sense of the scale and diversity of this incredible city.